As ISVs plan to expand their existing on-premise offering and evolving into additional cloud-service offerings, a very important consideration is often overlooked. Is it possible to effectively license the same application as both an on-premise solution and as a cloud-based service? In an ideal situation for ISVs, a successful hybrid application would be built using the same source code regardless if the application is delivered on-premise or as a service in the cloud. The licensing technology that controls and tracks the end users should not impose a requirement for the ISV to maintain separate code branches (one for on-premise and a different one for delivered as a cloud service). When delivering applications as a service, both the ISV and the customer benefit from the elastic infrastructure that the cloud offers. To take advantage of this elastic nature, the licensing system should not be bound or locked to infrastructure (instance ID, CPU characteristics, MAC addresses). Locking to infrastructure limits the ability to scale the application to a new bigger cloud instance (the underlying hardware has changed and the provisioned license is no longer valid). Additionally, when upgrading the application to a new version, it is common that an ISV will first create a new instance with the new version of software and then make the cut over and shut off the old instance when appropriate; locking to an instance ID for example will invalidate the license for the next version of software. When delivering applications as a service, both the ISV and the customer benefit from the elastic infrastructure that the cloud offers. However, to be able to take advantage of this elastic nature (read this as a revenue up- side from increased customer use), an ISV needs to be sure not to bind or lock a customer’s license to infrastructure (instance ID, CPU characteristics, MAC addresses). One key benefit of cloud and service-based offerings is creating an environment where a customer can gain as much value from your solution, while your revenue mirrors this received value. Your licensing solution should be binding to the user or the usage workload that occurs to avoid constraining this revenue upside. Having a licensing technology that controls end-user access to features and tracks their usage with an online licensing manager solves only half the battle. 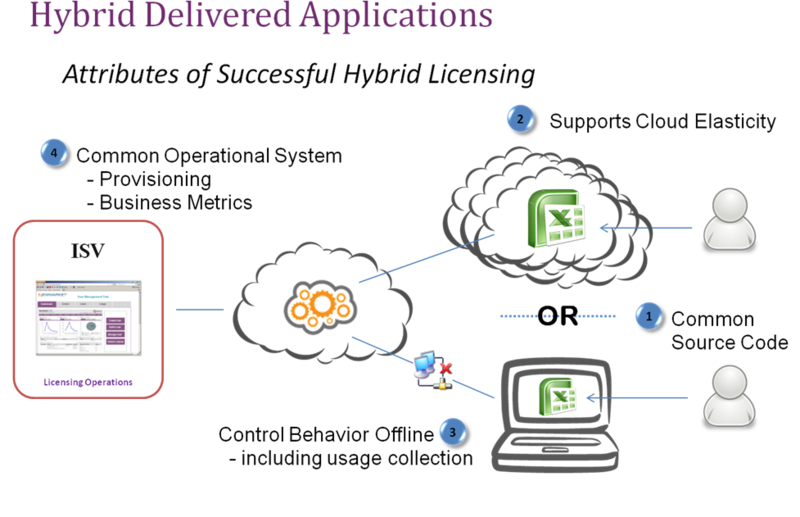 When monetizing an on-premise AND cloud-based offering, an ISV needs technology that also controls the behavior of the application when it cannot connect to an online licensing manager. In my experience, having the same licensing implementation control and track usage even when the application is offline is fundamental to have a common monetization strategy for the offerings. This will allow an end user to have the software installed locally, disconnect from the licensing service and use a local license to enforce the paid contract. Additionally, when offline, the local license will continue to collect all usage for which features are used, how often, and for how long. Once connected to the licensing service, the local license will synchronize: passing offline usage to the ISV and updating any changes to the local license as necessary. This is a great example of offerings which are some combination of a traditional on premise deployed application combined with a service or pay-per-use based aspect. No business owner wants two different systems for managing the same application. A great licensing system should provide an ISV with a common operational system that provides the tools to provision the licenses for the on-premise delivered solution as well as the application delivered as a cloud service. This common licensing operational system should also provide the ISV a uniform way to present the business metrics that lead to an improved offering. From understanding what is the trial conversion rate to understanding what the most popular features are across all offerings, ISVs gain valuable insight to make business decisions to constantly improve and measure an application’s success. Have you effectively licensed the same application as both an on-premise solution and as a cloud-based service? Share your experience here. A member of the SafeNet team for more than a decade, Todd Steel leads the product management efforts associated with SafeNet’s suite of software licensing and entitlement management cloud services.